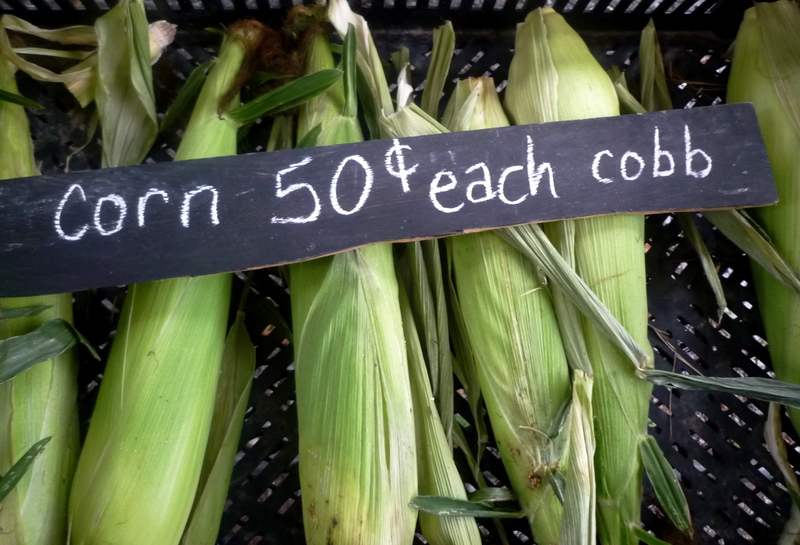 I was a bit taken aback to still see local corn at the market. 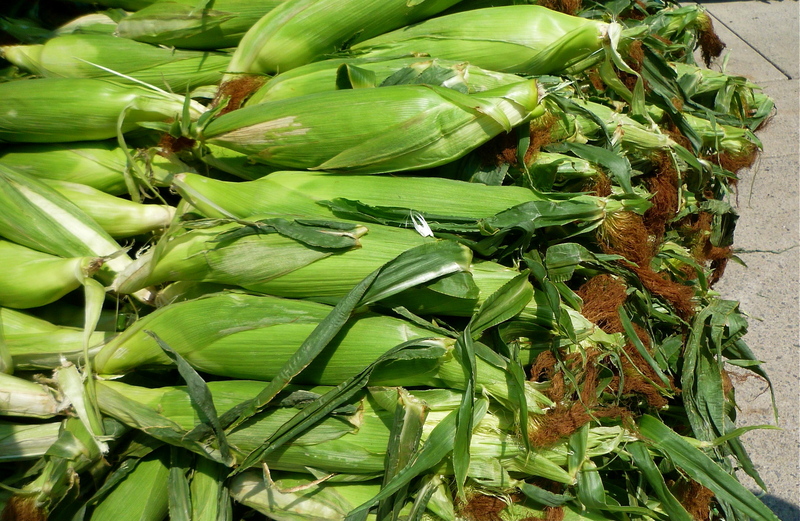 The husks looked sad and tired but the farmer ensured me that the corn was in fact sweet and tasty. I was skeptical but at $4 for 7 cobs, I figured it was worth giving them a try. I husked the corn and cut the kernels off the cob, sautéed them in butter and dressed them simply with some salt and pepper. Much to my surprise, it was delicious! I expected it to be dry and tasteless but it was sweet and juicy (although the cobs were quite small). It was almost certainly the last of the year and a sweet reminder of how much I will miss local corn over the next nine months or so. However, canned and frozen corn are usually decent enough to tide me over. 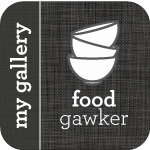 Check out the Corn Archives for some tasty corn recipes. 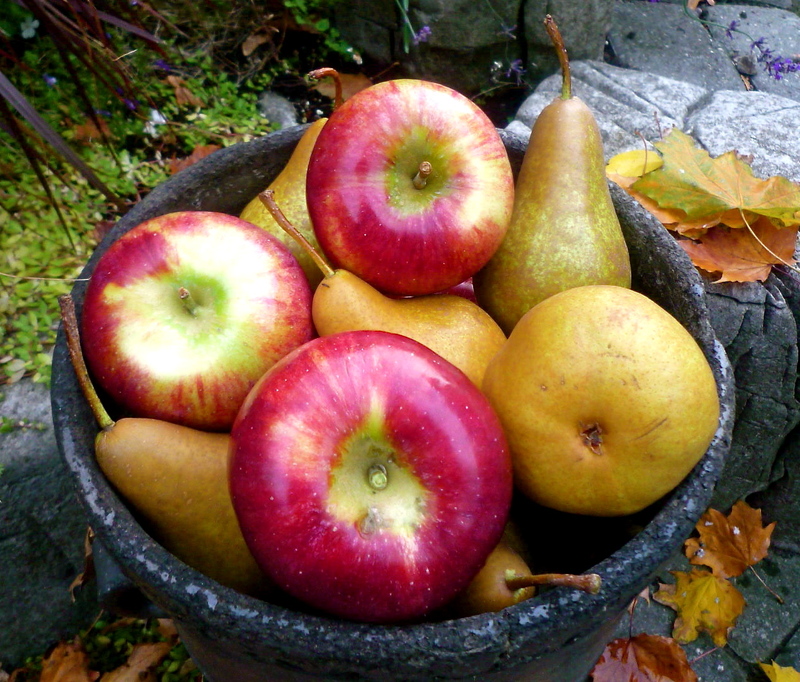 Apples and pears were abundant at this week’s market. There were many different varieties available and the farmers were offering samples so it was a great way to make comparisons. My favourite apples to eat out of hand are Cortlands – they are the perfect balance of sweet and tart. However, sometimes they can be a bit mealy and I prefer ones that are perfectly crisp and juicy. This week’s specimens were pretty good; I will eat a few and use the rest to bake with. Perhaps a classic Apple Pie will be on the menu. 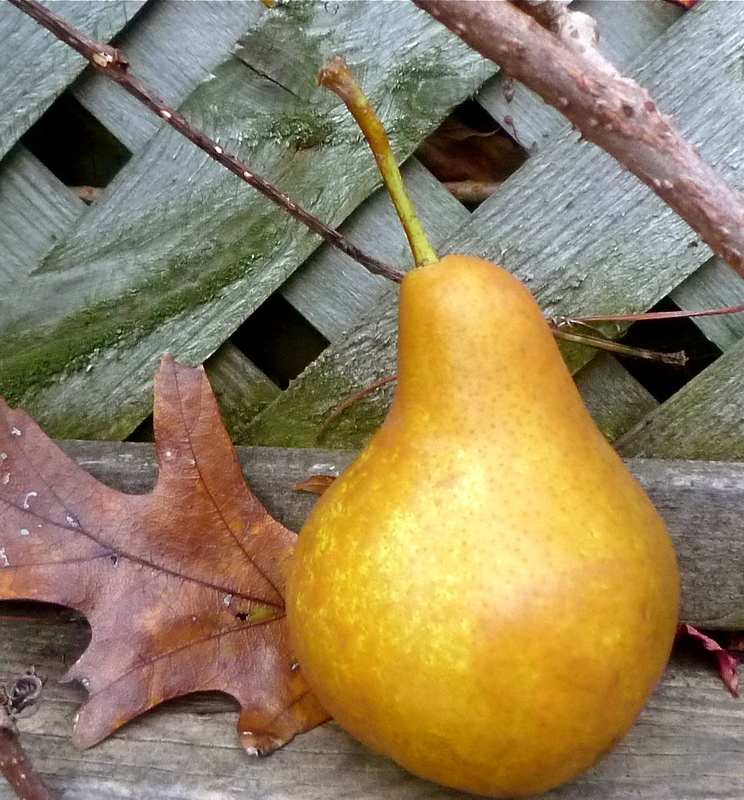 I also picked up some bosc pears after sampling various types including the always popular Bartletts. Pears are delicious with nuts and my recipe for Pear and Pecan Bread Pudding with Caramel Sauce is sure to be a hit at your next dinner party. An unusual pear cocktail is another fun way to incorporate pears into your menu. Not surprisingly, there were a lot of root vegetables such as carrots, beets and potatoes available. 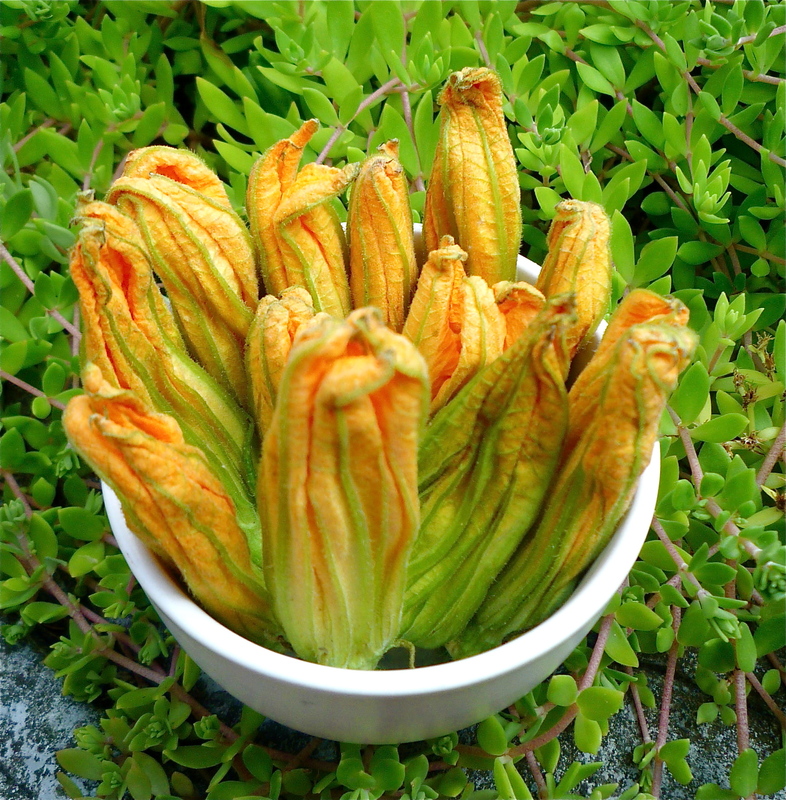 Because they can be harvested late in the season and store well, they are staples throughout the winter. Why not make an interesting salad out of roasted beets or some carrot cupcakes with cream cheese frosting? 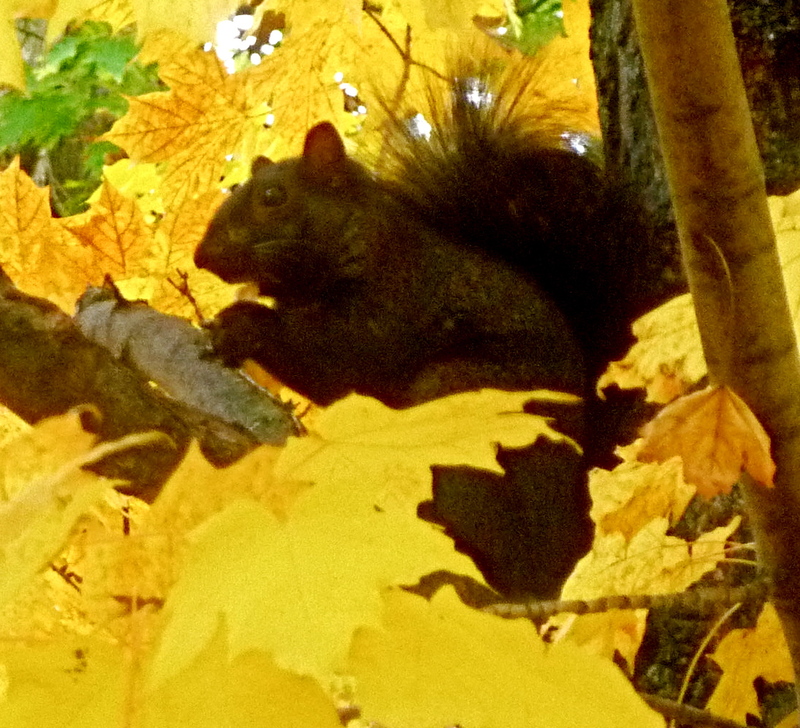 October is peak pumpkin season and the sunny, dry weather this year has produced some nice specimens. Large jack-o-lantern pumpkins aren’t very good for eating but they’re fun to carve and you can roast and eat the seeds. 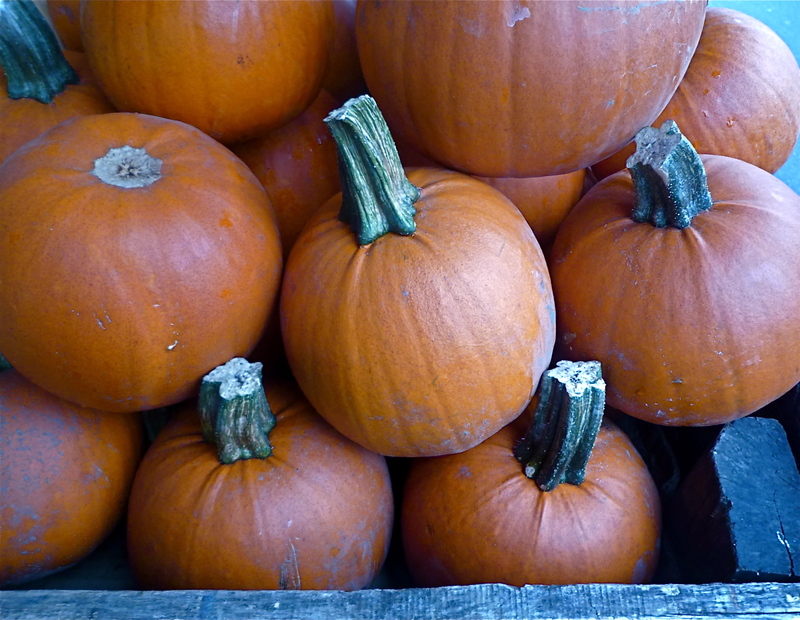 Sugar (or pie) pumpkins can be turned into a delicious pumpkin treats such as pie, pumpkin french toast or pumpkin spice muffins. My favourite winter squash are butternut squash – they can be used to make a variety of dishes such as soup, salads or gratins. There are a few more weeks left for local produce so I’m looking forward to testing some new ideas I have using the best of the season. Enjoy! Heirloom tomatoes at the market. Don't be fooled by their imperfect looks - they were delicious! 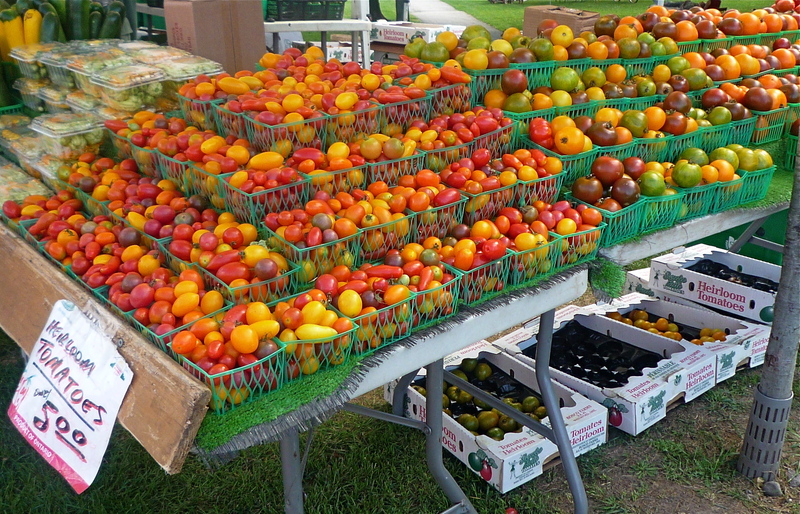 The king of late summer markets, tomatoes are finally in season. Last year I lamented how horrible the season was for tomatoes because the weather was cool and wet and there was a fungus that destroyed a lot of crops. However, all signs point to 2010 being a much better year thanks to hot and dry weather. 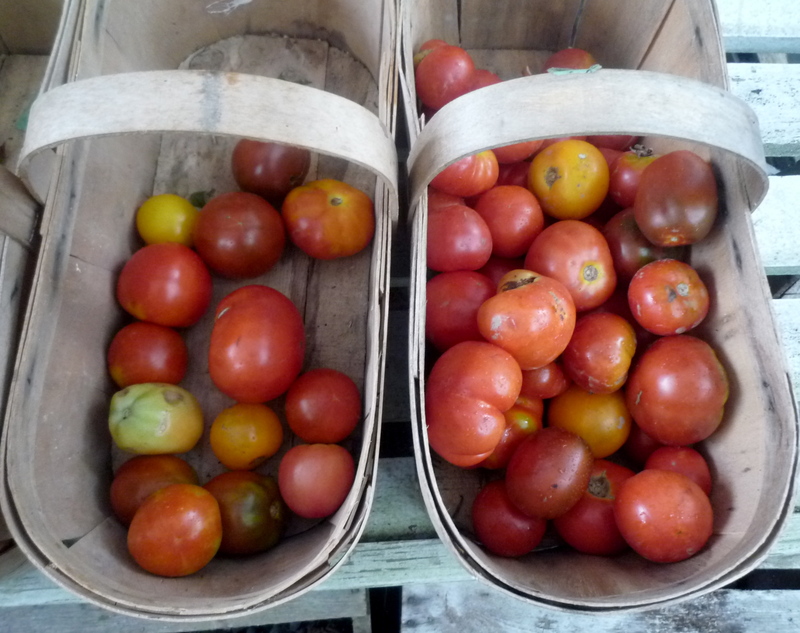 I’ve been experimenting with heirloom varieties, plum tomatoes and cherry tomatoes and so far I’ve been pretty pleased. The key to using summer tomatoes is to keep preparation simple. 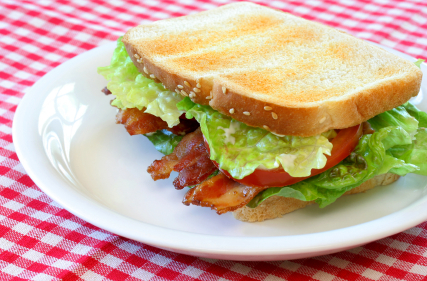 Why not make a classic BLT (Bacon, Lettuce and Tomato) Sandwich? When tomatoes are sweet and juicy, it just might be the perfect sandwich. Cook up some good quality bacon, cut some tomatoes into thick slices and add some cool, crunchy lettuce. A smear of mayo on lightly toasted bread finishes this masterpiece. For more great tomato ideas, check out the tomato archives: Tomato Recipes. 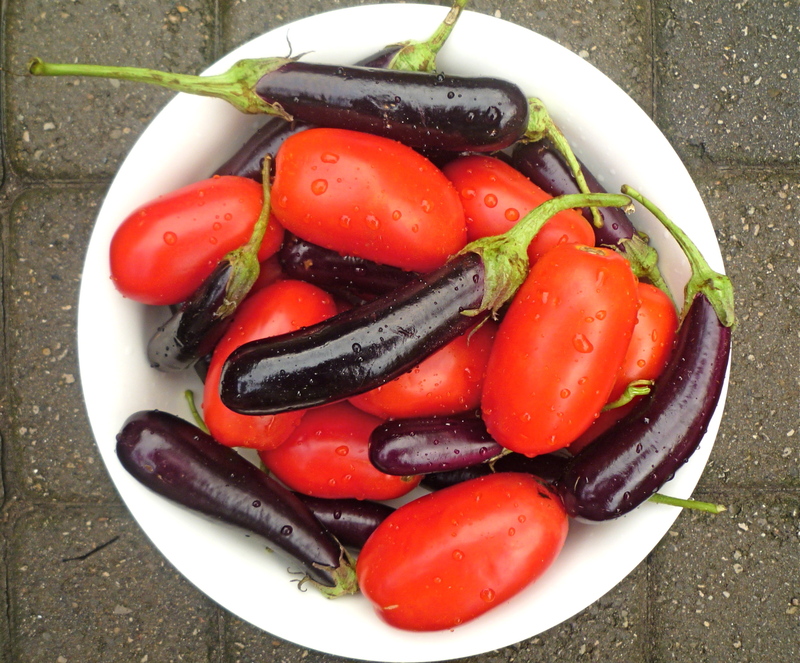 It took me a while to get into eggplant – I used to think it was bitter and mushy. However, now I love them, as long as they’re not too big (the bigger they are, the more watery and prone to bitterness they’ll be). 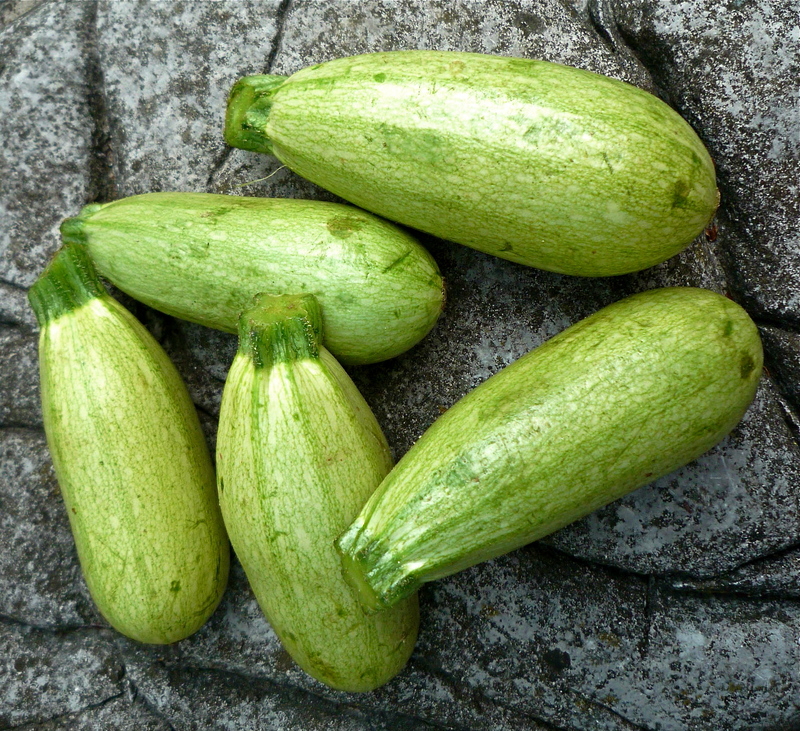 This week, there were eggplants of every size, from miniature ones not much bigger than my thumb to large ones you would normally see at the supermarket. For a fresh idea, why not make a simple Pasta alla Norma? 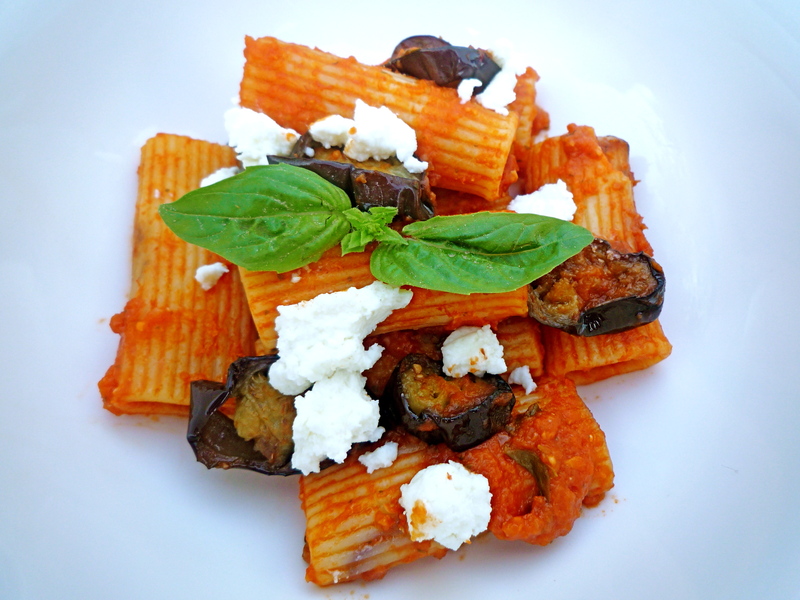 Last week I made a version with rigatoni, fresh plum tomatoes, fresh ricotta cheese and miniature eggplant rounds. This recipe from Mario Batali is similar but uses canned tomatoes instead: Pasta a la Norma. Corn was a bit early this year so it’s already starting to taper off. I’ve been enjoying it straight off the cob – boiled and simply dressed with butter, salt and pepper. However, Corn Chowder with Bell Peppers is a great way to use up extra corn (and local peppers, which are also in season right now). Leftover cooked corn can also be mixed with some fresh thyme, sage or basil and tossed with olive oil, parmesan and pasta for a simple, summery dinner. Local raspberries and blueberries are abundant right now and won’t last long so take advantage of them while you can. Raspberries are delicious in both sweet and savoury recipes so you can create an entire menu built around them. 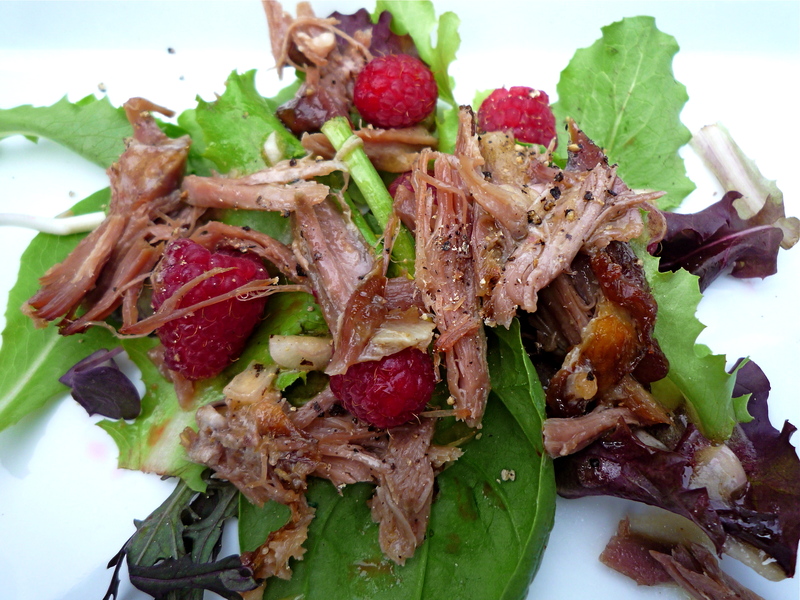 Start with a hearty main course salad such as Duck Confit Salad with Fresh Raspberries and finish with an impressive dessert like Raspberry and Dark Chocolate Tartlets. 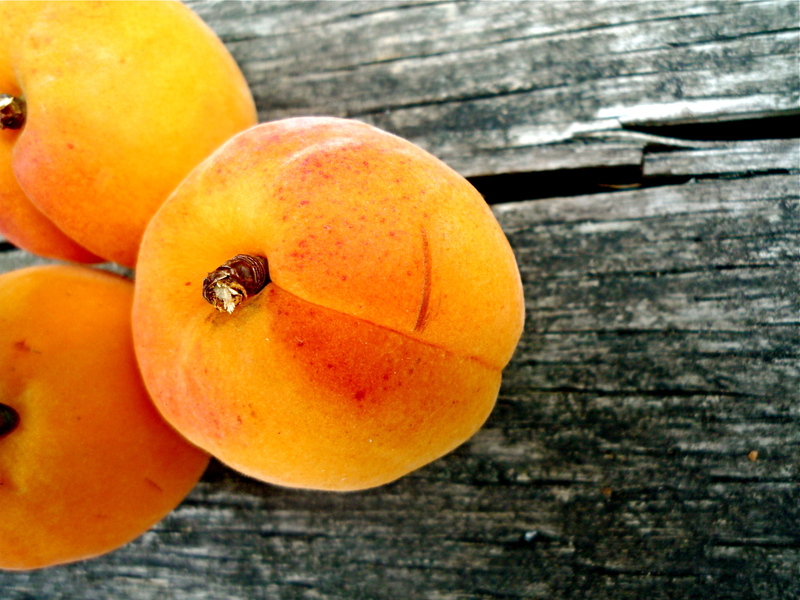 Autumn fruit such as plums, pears and apples have started appearing at the market. I’ve been focusing more on ‘summer’ fruit (such as the berries, above) but I did try some delicious plums and a beautifully crisp Cortland apple. Visit the apple archives for some tasty and impressive ideas: Apple Recipes. I’m a little saddened that in a matter of weeks this abundance of produce will begin to slow. However, I love fall (and the cooler weather that comes with it) so I’m looking forward to coming up with some great ideas for autumn. 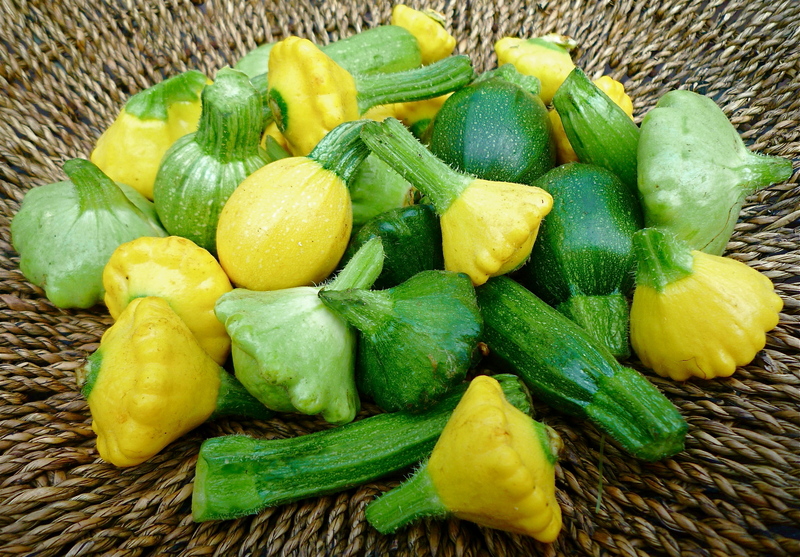 Plus, there is still plenty of summer left so hit the markets and enjoy!